A close friend once told me (while I was having car troubles) “If everything went right all the time, we’d never have anything to talk about years later” Not sure if that is entirely true but that day is etched in my mind as today will be in yours. Glad all has worked out and you met new friends. (Kim says) You were gone long enough that I was getting creeped out by the local, long bearded, tooth lacking guy who kept coming out of his trailer to look at me. Shouldn’t judge a book by it’s cover as he turned out to be very helpful. Stil let’s keep the car running tomorrow! As usual you are always able to get us back on the road. We’ve never had to be towed anywhere that I can remember. Oh, I just remembered the Harley!! 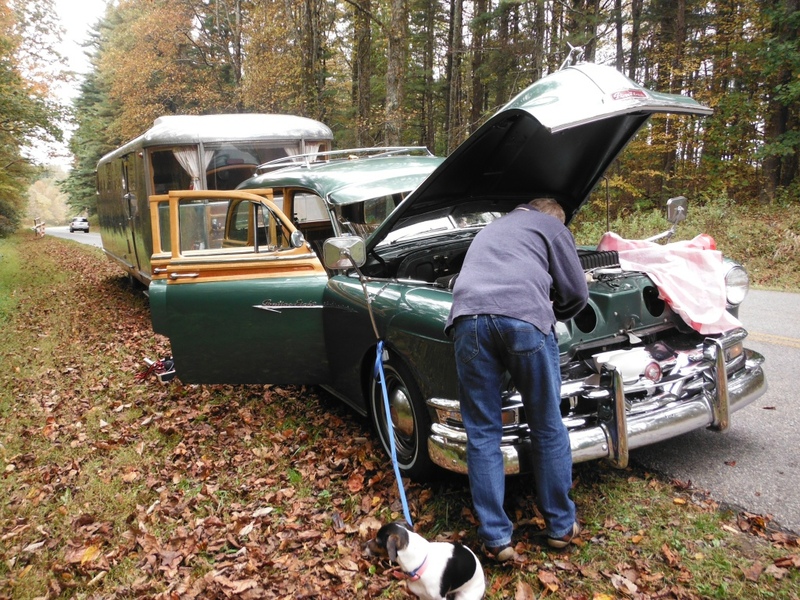 I know how much it costs to have a Spartan trailer flat-bedded from VA to MI, so we were fixing it right here! Sounds like a great adventure!!! II knew you would get her home. Brian I am sorry for you and Kims problems, but the view from Fancy Gap might be worth it.. I will never forget the first time I rode through there, not expecting anything spectacular and was awed by the view. Good luck on the balance of your trip!